The construction of U.S. Highway 41 (Tamiami Trail), the Southern Golden Gate Estates development, and the Barron River Canal has altered the flow of freshwater to the Ten Thousand Islands estuary of Southwest Florida. Two restoration projects, the Picayune Strand Restoration Project and the Tamiami Trail Culverts Project, both associated with the Comprehensive Everglades Restoration Plan, were initiated to address this issue. Quantifying the flow of freshwater to the estuary is essential to assessing the effectiveness of these projects. The U.S. Geological Survey conducted a study between March 2006 and September 2010 to quantify the freshwater flowing under theTamiami Trail between County Road 92 and State Road 29 in southwest Florida, excluding the Faka Union Canal (which is monitored by South Florida Water Management District). The study period was after the completion of the Tamiami Trail Culverts Project and prior to most of the construction related to the Picayune Restoration Project. The section of the Tamiami Trail that was studied contains too many structures (35 bridges and 16 culverts) to cost-effectively measure each structure on a continuous basis, so the area was divided into seven subbasins. One bridge within each of the subbasins was instrumented with an acoustic Doppler velocity meter. The index velocity method was used to compute discharge at the seven instrumented bridges. Periodic discharge measurements were made at all structures, using acoustic Doppler current profilers at bridges and acoustic Doppler velocity meters at culverts. Continuous daily mean values of discharge for the uninstrumented structures were calculated on the basis of relations between the measured discharge at the uninstrumented stations and the discharge and stage at the instrumented bridge. Estimates of daily mean discharge are available beginning in 2006 or 2007 through September 2010 for all structures. Subbasin comparison is limited to water years 2008–2010. The Faka Union Canal contributed more than half (on average 60 percent) of the flow under the Tamiami Trail between State Road 29 and County Road 92 during water years 2008–2010. During water years 2008–2010, an average 9 percent of the flow through the study area came from west of the Faka Union Canal and an average 31 percent came from east of the Faka Union Canal. Flow data provided by this study serve as baseline information about the seasonal and spatial distribution of freshwater flow under the Tamiami Trail between County Road 92 and State Road 29, and study results provide data to evaluate restoration efforts. Appendix 1 and 2 provide regression equations and R2 and standard error values. Appendix 3 provides daily mean discharge and stage data. 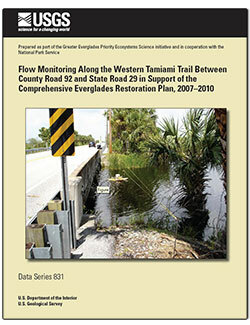 Booth, A.C., Soderqvist, L.E., and Berry, M.C., 2014, Flow monitoring along the western Tamiami Trail between County Road 92 and State Road 29 in support of the Comprehensive Everglades Restoration Plan, 2007–2010: U.S. Geological Survey Data Series 831, 24 p. + appendix tables A1–A3 (Excel), https://dx.doi.org/10.3133/ds831.